 An arresting albeit donnish, reappraisal of the forces driving the global economy, from a man of the left who minces few words about his progressive agenda. Citing credible data--compiled by Dun & Bradstreet and others- -Harrison (Political Economy/Carnegie Mellon Univ.) puts paid to the widely held notion that small firms are the primary source of new jobs. Nor, he goes on to show, are bantamweights notably adept at creating, much less applying, advanced technologies. By almost any standard, according to Harrison (co-author of The Deindustrialization of America, not reviewed), large multinational corporations still dominate the marketplace. 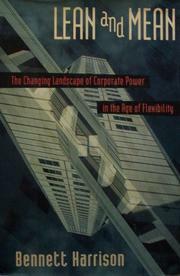 In response to a worldwide profit squeeze during the early 1970s, they shed staff, experimented with so-called outsource contracting, decentralized production as well as management-information facilities, concluded strategic alliances, and otherwise equipped themselves to survive and thrive in an increasingly competitive environment. Harrison's greatest fear is that lean may portend genuinely and persistently mean. His stated desire is ``to promote local economic development with equity,'' an objective he concedes could prove elusive in a world where regional output as often as not is remotely controlled. Focusing on the demand side of the equation, the author decries low-road economic rivalry in which wages and taxes are forced down to the detriment of the infrastructure and labor's purchasing power. To aid effective monitoring and regulation of the socioeconomic behavior of multinationals, he advocates that member countries of the Organization for Economic Cooperation and Development adopt the moral equivalent of common industrial policies, a position certain to draw fire from the right. While Harrison's graceless writing style and penchant for references of interest mainly to fellow academics could deny him a general readership, his persuasively documented and principled text represents a substantive contribution to the public debate on economic development at the community as well as the global level.